Generous rooms in this one bedroom unit with tons of natural light from bank of windows along dining room and living room. Plenty of room for separate office space off living room. Laminate just installed in bedroom and 3 yrs new in living room. 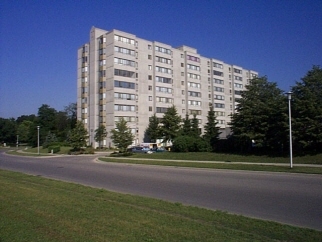 Location is handy to UWO, Cherry Hill Shopping Centre and Downtown London, bus stops right outside building. Short walk to new Sugar Creek Café and indoor salt water pool recreation facility. Appliances are included. Note, exterior of building is concrete.